How the landmark gender-equity law has—and hasn’t—evened the playing field. Bernice Sandler, who helped draft the legislation back in 1972, recently told ESPN, “The only thought I gave to sports when the bill was passed was, ‘Oh, maybe now when a school holds its field day, there will be more activities for the girls. '” During the Senate hearings on the bill—aside from one Senator’s crack about coed football which drew hearty guffaws—sports weren’t mentioned at all. 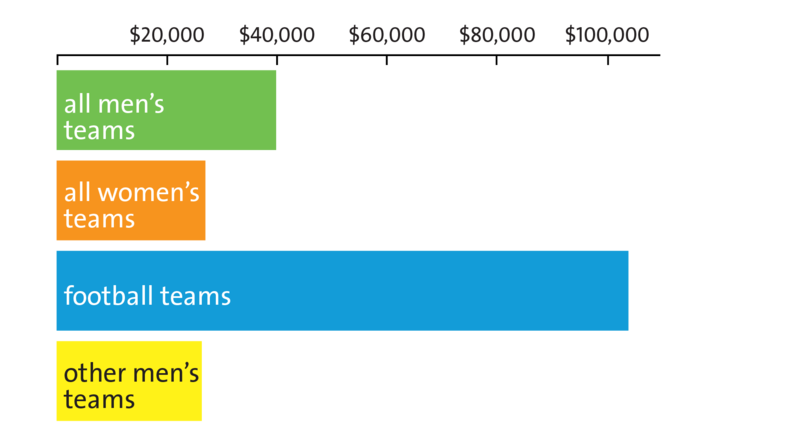 Yet progress towards gender equity in sports has been uneven and incomplete. 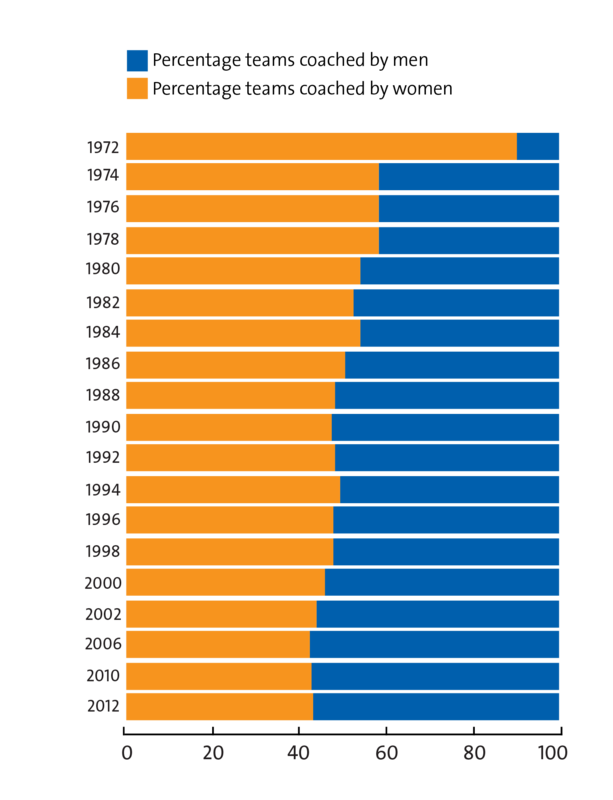 Here are five charts showing what’s changed—and what hasn’t—since Title IX’s passage in 1972. Between 1972 and 2011, the number of girls competing in high school sports jumped from under 295,000 to nearly 3.2 million, according to data from the National Federation of State High School Associations. But girls’ opportunities still haven’t reached the level that boys were at back when Title IX was passed, and high schools today provide 1.3 million fewer chances for girls to play sports. There are more women playing collegiate sports—about 200,000—than ever before. 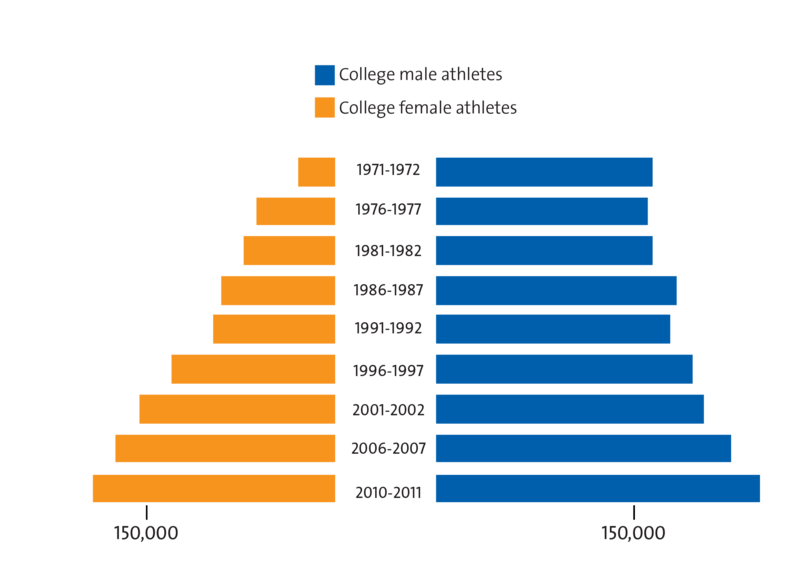 The number of female athletes at NCAA schools has increased from less than 30,000 to over 193,000 since 1972, but women still have over 60,000 fewer participation opportunities than their male counterparts. Speaking of coaching, the spike in female athletes hasn’t led to a corresponding rise in women coaches—quite the opposite, actually. While women coached more than 90 percent of women’s teams in 1972, today that number has dropped to about 43 percent, according to the most recent survey of NCAA schools by Brooklyn College researchers. The percentage of men’s teams coached by women has continued to hover around a negligible 3 percent. And despite the fact that millions of women and girls are competing, they’re unlikely to see athletic role models of their own gender in the media. A 20-year study of sports coverage by University of California and Purdue researchers shows the short shrift women’s sports receives compared to men’s on network news and ESPN Sportscenter: In 2009, women’s sports got only 1.6 percent of the airtime, down from 6.3 percent in 2004. Most importantly, Title IX hasn’t managed to extend the enormous social and health benefits of sports to all girls equally. In 2008, a national survey of third- through 12th-graders by the Women’s Sports Foundation found that 75 percent of white girls play sports, compared to less than two-thirds of African-American and Hispanic girls, and about half of Asian girls. And while boys from immigrant families are well-represented in youth sports, less than half of girls from those families are playing. * The gender gap is also worse in urban schools and among kids from low-income families. Correction: An earlier version of this article included a chart with incorrect data on youth sports participation. It has been removed.